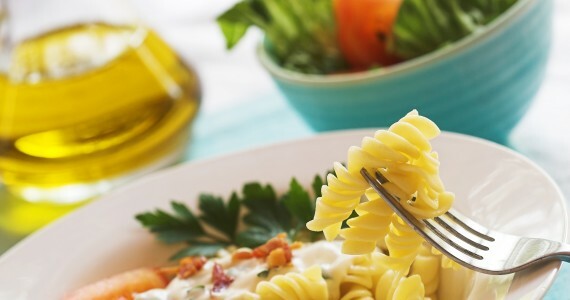 If you follow a few simple rules cooking Rizopia Fusilli, Penne, Elbows, Fantasia pastas you will get perfect results. Nobody will know they are eating gluten free pasta. It will have texture, flavour and all the goodness of whole grain organic brown rice. Bring a large saucepan of water to the boil. The more water the better. Salt maybe added if required but is not necessary. Put a colander in a sink; fill a bowl with cold water and fill and boil a kettle. When saucepan has a rolling boil, add the required amount of pasta, we always allow 125g per person. Add a small handful at a time until you have added all the pasta. As soon as the pasta starts to soften, stir it to ensure that it doesn’t stick together. Stir now and again to ensure it doesn’t stick. Cook for 7 to 10 minutes depending on how firm you like your pasta. Because it is a natural whole grain product it will throw starch which will make the water cloudy, don’t worry it has no effect on the quality of the pasta. Check your pasta and, when the required texture, drain the pan into the colander then tip into the bowl of cold water. Rinse well and cool, so it stops cooking. Tip back in to the colander. When your sauce is ready, tip the contents of the boiled kettle on to the pasta in the colander and you are ready to serve.